Your tour guide to the world of jazz improvisation on guitar. With so much information available to the modern guitar student, my book Keys to Unlocking the Fretboard acts as your tour guide by providing you essential systems and exercises to unlock the fretboard and become an advanced improviser. You don't have to be stuck in positions anymore. It doesn't have to be that way with chords or scales. This book will not only teach you how to play any chord or scale anywhere on the fretboard but it will also show you how to apply them to progressions. This book teaches you harmony, music theory and fretboard logic through the mind of a jazz guitarist. It uses mostly jazz harmony but the concepts and systems can be applied to any style of guitar playing. Keys to Unlocking the Fretboard gives you simple, fundamental systems that become part of your practice routine. It's just like exercising. You need a routine. Plus, each key is designed to work several areas of your playing at once helping you get the most out of your practice time! Topics covered in the book include set up, tone, how to practice, chords, modes, scale choices, how to play with the metronome, Major and Minor ii V i with scale choices, arpeggios, chord construction, altered dominant chords and scales, pentatonic modes, Lydian concepts, Harmonic and Melodic modes and usage, several common jazz chord progressions with scale choice analysis and more. In addition to creating a program for you to develop as a guitarist, Keys to Unlocking the Fretboard once again acts as your tour guide by suggesting good jazz albums to own, artists to check out and multiple lists of the most played jazz tunes/tunes you should know. Stop wasting time, money and energy looking for random concepts (that may or may not be meaningful) to add to your disorganized practicing! Let Keys to Unlocking the Fretboard be your tour guide pointing out important landmarks along your journey. Develop a well balanced practice routine that will take your playing to new levels on a consistent basis. It's time to stop searching and start practicing the keys to unlocking the fretboard! as well as challenged by him. I have known Brian Baggett for many years. 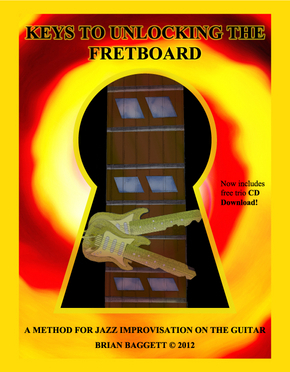 provides guitarists with a step-by-step pedagogical approach to jazz improvisation and technique. This book is for all aspiring jazz guitarists young and old. a must have for all music educators. *SOLD OUT* Book and DVD COMBO SAVE $10 and combine shipping! !